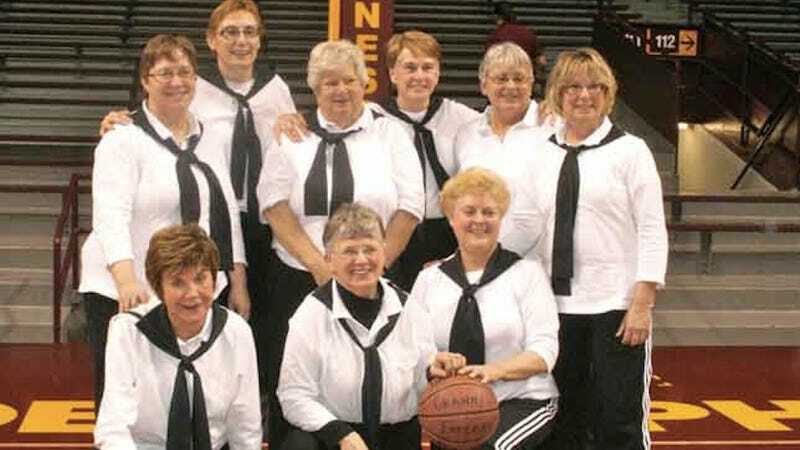 A group of Minnesota women have banished their bridge leagues and weekly mahjong get-togethers to form a slightly more active social group: a basketball league for older women only. And while there's no running or jumping allowed in Granny , it's hard not to watch them play without feeling your heart grow so rapidly that it sort of makes you wonder if this is phase one in an elaborate effort to physically best eventually enslave the human race. Adorably. The Faribault, Minnesota Hotshots don't play using the same rules as your standard NCAA or Space Jam team. Instead, the court's divided into three parts and players aren't allowed to leave their designated area. Quarters are 8 minutes long and there's no running or jumping allowed, and the clock stops when a "granny falls down," according to sixty-seven-year-old Hotshot Judy Lee. While a few of the "grannies" are seasoned athletes (one used to play college basketball), many Hotshots are complete novices who have never played before. The talent disparity among the players doesn't stop the team from being more entertaining to watch than old VHS tapes of my sixth grade basketball games, which were basically four quarters of the ball going up into the air and brushing the underside of the net before descending into a tangle of waiting skinny arms. These ladies are hitting the backboard. They're executing successful bounce passes. They're spending more time on fundamentals than on matching gameday hairstyles and matching body team body glitter. They're serious about the game, and they're serious about staying healthy, active, and social. Minnesota boasts one other "granny" team besides the one in Faribault, in Wanamingo, and when the two teams play each other, their families come out to watch. The Twin Cities' WCCO spoke with the daughter of one player, who said she was proud of her mom. The husband of another player described his wife's devotion to the game as "serious stuff" and noted that "she isn't fooling around, she doesn't want to look like anybody's idiot." The Greatest Generation is already better at living frugally, quipping, and managing themselves as adults than any generations that have followed. If they become collectively better at basketball, too, then we may as well all quit.